On a Windows 10, 8 or 7 based computer the following BSOD error may appear: "DPC_WATCHDOG_VIOLATION". The blue screen problem "DPC WATCHDOG VIOLATION" commonly occurred occasionally, even if the system is idle and commonly is caused from an invalid or damaged device driver and in some other cases is related to hardware problems especially with the Graphics card. This troubleshooting guide contains several methods to resolve the DPC WATCHDOG VIOLATION BSOD problem on Windows 10, 8/8.1 or 7 OS. 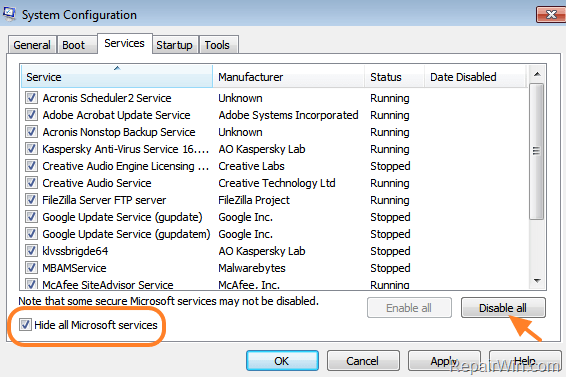 How to FIX DPC WATCHDOG VIOLATION BoSD Problem on Windows 10/8/7. The first step to resolve the "DPC WATCHDOG VIOLATION" blue screen problem, is to ensure that your system is virus/malware free. For that task follow the instructions in this guide: How To Scan Your Computer for Viruses and other Malicious Programs. The "DPC WATCHDOG VIOLATION" blue screen problem, may caused after the automatic update of your Antivirus/Security program (especially if you 're using AVAST or AVG). So, proceed and completely uninstall your antivirus program from your system and restart your computer. The next method, to resolve the "DPC WATCHDOG VIOLATION" BSOD problem, is to start Windows in a "clean boot" state, in order to identify which program causes your system to crash. Method 5. Update Display & Network Drivers. 2. Ethernet Adapter & Wi-Fi adapter (if exists). 1. if the BSOD problem persists, after updating the above drivers, then proceed and update all other drivers on your system (Chipset, Audio drivers, etc.). 2. In some cases the "DPC_WATCHDOG_VIOLATION" error may occur if you have a Solid State Drive (SSD). So, if you own an SSD drive, proceed and update the firmware on the drive. For instructions on how update the SSD firmware, look at your SSD manufacturer's website. Method 6. 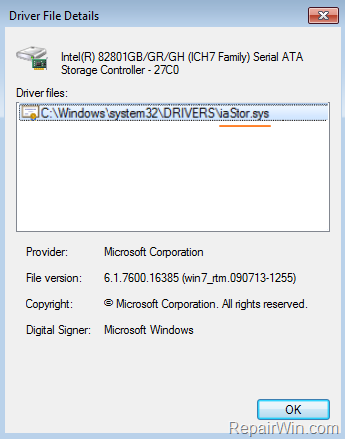 Update iaStor.sys Driver. 2. Expand IDE ATA/ATAPI Controllers. 3. Double click at SATA/AHCI Controller. 3. Select the Driver tab and click Driver Details. 4. If you 're using the iaStor.sys driver, then click OK and proceed to change the driver as mentioned below, otherwise skip the rest steps. 8. 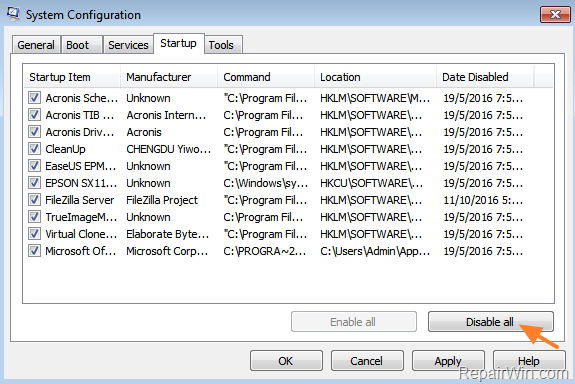 Click Let me pick from a list of device drivers on my computer. 9. 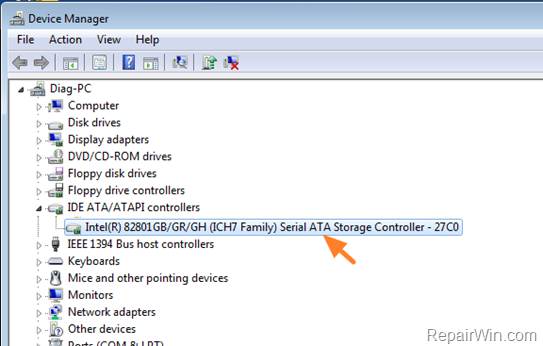 Highlight the Standard SATA AHCI Controller and click Next. 10. 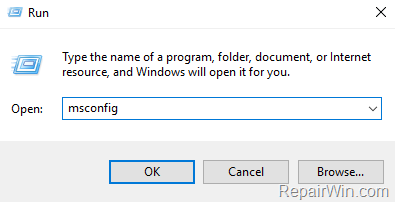 When the driver installation is completed, close all open windows and restart your computer.